Humpback whales are among the animals that could be affected by seismic surveys for oil and gas. President Trump is opening up the Atlantic Coast to companies to explore for fresh reserves. 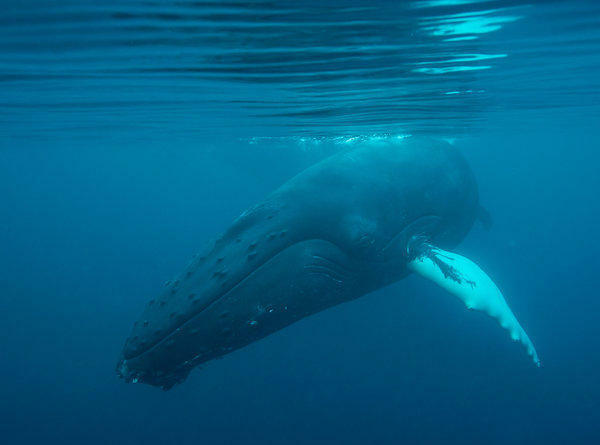 And to explore, they will be making some of the loudest sounds ever heard in the ocean — sounds that, according to recent research, could harm marine animals from whales to plankton. Five companies are currently applying for permits to use seismic air guns to survey thousands of miles of the seabed along the Atlantic Coast. If they get the permits, they could start later this year. The air guns are devices towed behind a ship. They compress and then release air explosively, and the sound waves penetrate the seabed. When they bounce back to receivers, also towed from the ships, the sound waves paint a picture of reservoirs of oil and gas beneath the seabed. The sound blasts can also damage the ears and internal organs of marine animals. Ships will have to turn them off if they see whales or other marine mammals nearby. But there's growing evidence that these sounds may seriously affect animals swimming well outside the immediate danger zone. Aaron Thode is an oceanographer who's studied the subject and advises the Marine Mammal Commission, a federal agency that regulates activities affecting marine life. "We don't know what happens if animals are exposed constantly to sound over long periods of time in, say, a feeding area or a breeding area or what not," Thode explains. Thode works at the Scripps Institution of Oceanography. He says whales have been observed retreating from the sound of air guns. That could cause them to abandon breeding or feeding grounds. Thode's own research has shown that bowhead whales start calling more often to each other when there's air gun noise, at least for a while. "At some point, you know, just as if a jet plane passes overhead, you just give up and wait for the sound to decrease," Thode says. If the whales go silent, that not only has potential effects on their communication, but also on air gun surveyors. Federal rules require them to listen to for whale sounds and, if they hear them, to stop their air gun blasts. But if the whales aren't making noise, their presence underwater won't be known unless they're sighted at the surface. Scientists believe that air gun sounds could "mask" communication by marine animals. Surveyors will be blasting several times a minute, for months at a time. Marine biologist Doug Nowacek at Duke University worries that that kind of constant noise could cause a mother, for example, to lose track of its calf. "If they get separated by a few tens or hundreds of meters in an increasingly loud ocean," he says, "you can consider it gone." Nowacek says recent scientific evidence suggests that these more subtle effects of air guns could extend a long way. "The levels that could still have and do have behavioral impacts extend out tens, and hundreds of miles away from those surveys," he says. And effects on smaller animals are emerging as well. Research in Australia shows that nearby air guns can actually kill shrimp-like plankton and their larvae. Even scallops have been observed recoiling from air gun sound. Interior Secretary Ryan Zinke rolled out the offshore energy plan at a press conference in January. He promised that the government will protect the environment. "We do it right," he said, "and we're not going to skirt protections, we're not going to give anyone a pass. We're going to hold corporations accountable." The Interior Department completed an environmental impact study on seismic surveying in 2014 that runs several hundred pages. It says the effects on marine life will be moderate at worst. It points out that surveyors will stop their work if they see or hear whales within 500 yards and will keep away from places they're known to frequent. "No significant impacts are expected to occur as a result of these seismic surveys," the Interior Department stated. The department estimates that there may by 90 billion barrels of undiscovered oil and over 300 trillion cubic feet of natural gas under the outer continental shelf along the Atlantic Coast. But more than 70 scientists have written to Trump asking him to cancel the surveys anyway. They note that the surveys cover regions populated by several kinds of whales that are close to extinction. "The magnitude of the proposed seismic activity is likely to have significant, long-lasting and widespread impacts on the reproduction and survival of fish and marine mammal populations in the region," the letter stated. Doug Nowacek is one of the scientists who signed the letter, and he adds that there's just not enough information to be sure the surveys are harmless. "There are numerous species off the Atlantic Coast that we don't have any data whatsoever about their response to seismic," he says. Scientists at the National Oceanic and Atmospheric Administration have been trying to take a census of what marine life lives along the continental shelf, where much of the surveying will take place. The region is heavily populated not only with several kinds of whales but dolphins and numerous other species, many of them commercially valuable. NOAA is still far from completing the task. Given that the surveys would cover tens of thousands of miles of ocean with potentially millions of sonic booms, there's no doubt that marine animals will be exposed. Exploration companies maintain that there's no evidence that seismic testing has killed marine mammals. However, for several years, scientists have been working with exploration companies to develop newer air guns that are quieter. Some of these have been tested and found to work effectively at locating oil and gas reservoirs but they are not used commercially. The Interior Department is expected to rule on the surveying permits in the next few weeks. Environmental and public interest groups are planning to legally challenge those permits if they are approved. Many animals that live in the ocean communicate with sound, like this humpback whale. SHAPIRO: But these voices could soon be drowned out by powerful sonic booms set off in the ocean by energy companies. The Trump administration is opening up the Atlantic coast to oil and gas exploration. Biologists say just the process of looking for undersea reservoirs could threaten ocean life, as NPR's Christopher Joyce reports. CHRISTOPHER JOYCE, BYLINE: There's a human-made sound that dwarfs all others in the ocean - the boom of seismic air guns. JOYCE: Five companies plan to use air guns to survey thousands of miles of seabed along the Atlantic coast. That could start later this year. The air guns are towed behind the ship. They compress and then release air explosively, and the sound waves penetrate the seabed to reveal reservoirs of oil and gas. Ships have to turn them off if they see whales or other marine mammals nearby. The sound blasts can damage the ears and internal organs of animals. But scientists are increasingly concerned about less obvious effects of air guns well outside the immediate danger zone. Aaron Thode is an oceanographer who studied the effects of air guns. AARON THODE: We don't know what would happen if animals were exposed constantly to sound over long periods of time in, say, a feeding area, a breeding area or whatnot. JOYCE: Thode works at the Scripps Institution of Oceanography. He says whales have been observed retreating from the sound of air guns. That could cause them to abandon breeding or feeding grounds. Thode has also discovered that bowhead whales start calling more often to each other when there's air gun noise, at least for a while. THODE: At some point, you know, just as if a jet plane passes overhead, you'll just kind of give up and wait for the sounds to decrease. JOYCE: Whales and dolphins and even fish signal each other with sound. Marine biologist Doug Nowacek at Duke University worries that air guns could overwhelm that communication that could cause a mother, for example, to lose its calf. DOUG NOWACEK: So if they get separated by a few tens or hundreds of meters in an increasingly loud ocean, you can consider it gone. JOYCE: Nowacek says new evidence shows animals can be a long way from the air guns and still be affected. NOWACEK: The levels that could still have and do have behavioral impacts extend out tens to hundreds of miles away from those surveys. JOYCE: And effects on smaller animals are emerging as well. Research in Australia shows that air guns can actually kill shrimp-like plankton. Moreover, the sound is pervasive. Surveyors fire the air guns several times a minute for months at a time. Interior Secretary Ryan Zinke described the energy plan at a press conference last January. He promised that the government will protect the environment. RYAN ZINKE: We do it right. And we're not going to skirt protections. We're not going to give anyone a pass. We're going to hold corporations accountable. JOYCE: The Interior Department completed an environmental impact study on seismic surveying in 2014. It says the effects on marine life will be moderate at worst. They point out that surveyors will stop their work if they see or hear whales within 500 yards and will keep away from places they're known to frequent. But more than 70 scientists have written to President Trump asking him to cancel the surveys anyway. They note that the blasting covers regions populated by several kinds of whales that are in danger of extinction. Doug Nowacek is one of those scientists. NOWACEK: There are numerous species off the Atlantic coast that have never been - we don't have any data whatsoever about their response to seismic. JOYCE: The Interior Department is expected to rule on the surveying permits in the next few weeks. Environmental and other interest groups are preparing to legally challenge any permit to allow seismic testing. Christopher Joyce, NPR News. (SOUNDBITE OF ED SHEERAN SONG, "I SEE FIRE (KYGO REMIX)") Transcript provided by NPR, Copyright NPR.